APD Dumfries maintained their lead at the top of National League Division 2 winning by 21 runs at RH Corstorphine by the Duckworth Lewis method in a rain affected encounter. They totalled 255 for 8 with Josh Geary top scoring with 92 and Scott Beveridge hitting 81. The home side had reached 104 for 3 when rain eventually won in the twenty ninth over. 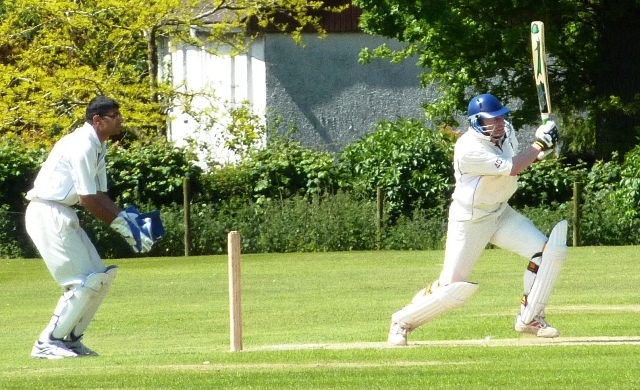 Dumfries were put into bat in what seemed good sunny batting conditions but an lbw in the first over to Allan and another a few overs later put the side on the back foot. However the cavalry came from down under as Beveridge and Geary restored fortunes. They shared a hundred and thirty run partnership as they gradually increased the innings run rate to five an over. Then the RHC professional Ramzan came back and, in his first over, had Beveridge stumped for 81 and then Corbett-Byers caught and bowled to make it 156 for 4 after 34 overs. Drew Dawson was next man in and provided Geary with valuable support scoring at more than a run a ball to end up with 45. Geary was out, disappointingly, eight short of his century with four overs to go, another Allan victim, and there was a wicket in each of those last four overs in the rush for runs. 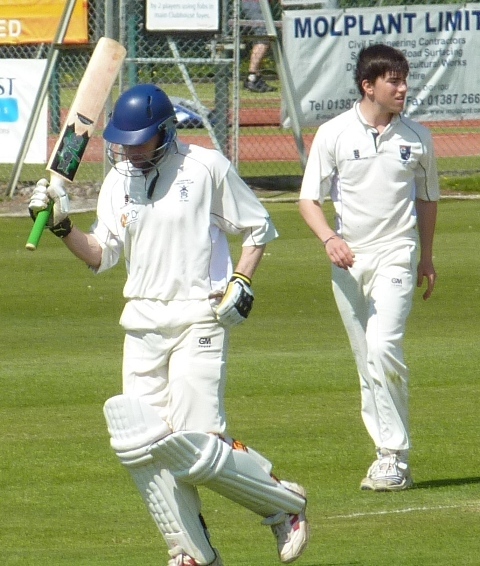 Allan and Ramzan both finished with four wickets as Dumfries totalled 255 for 8. In the second innings the rain on the radar was closing in and RHC batted in conditions significantly different from the first. Robert McBride achieved a breakthrough thanks to a catch by Telfer but after a sudden burst of boundaries was replaced by Jim Patterson. He and Alan Maskrey bowled well with Dumfries working to keep the total lagging behind the Duckworth Lewis par score as the rain fell and the ball became more difficult to control. Maskrey struck with the score at fifty taking two wickets, one a great diving slip catch by Geary. However the opener Ramzan remained but he bided his time despite the prospect of the rain ending the match. Crucially Jim Patterson bowled out his ten overs and conceded only 20 runs. When the game was stopped due to the conditions RHC needed to be past 125 but were 21 runs short on 104 for 3. Ramzan finished with 51 not out and captain Adams 22 not out. On the Sunday the same two sides were back at the same ground for a second round Scottish Cup tie. This time there was more rain to watch but the match was abandoned without a ball being bowled. That tie is due to be replayed this Sunday and with an away league match against SMRH on Saturday it means another two games in Edinburgh this weekend. The winner of that cup match has the prospect of a distant quarter final tie away to Division 1 side Stoneywood-Dyce, league adversaries two seasons ago, but with a distinct opportunity of a semi-final place. 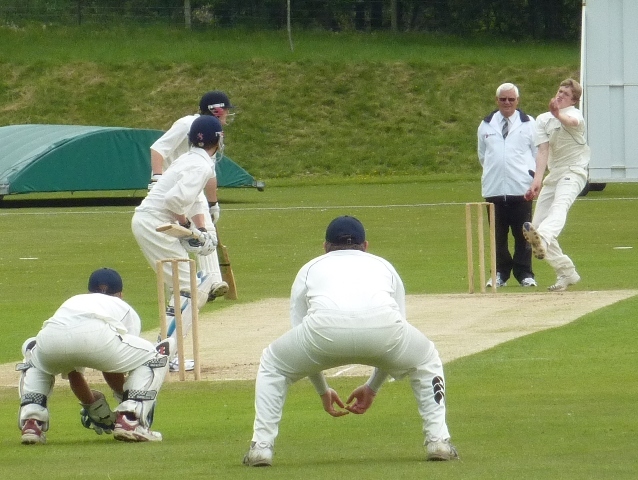 At Nunholm on Sunday, Scotland U15s played Cumbria U15s in the ECB U15 Championship. Scotland were in a good position with Cumbria U15s on 115 for 5 wickets after 25 overs when the heavens opened resulting in the match being abandoned. Thanks to those club members who assisted at the ground to ensure the day went smoothly. 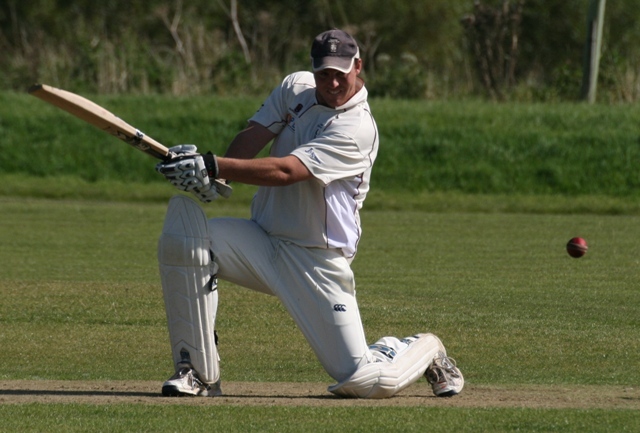 JMS Nunholm lost their match against GHK by three wickets at Nunholm on Saturday in Western Union Division 2 when the visitors successfully chased the home side’s total of 252 despite wickets from Chris McCutcheon and Davie Davidson and first innings runs by Graeme Cross and Davidson. The day started serenely enough with Nunholm choosing to bat in the sun. Two brief batting cameos reduced the side to 24 for 2 but Farries and Davidson steered the ship to 64 in the 16th over when Farries was out caught for 27. 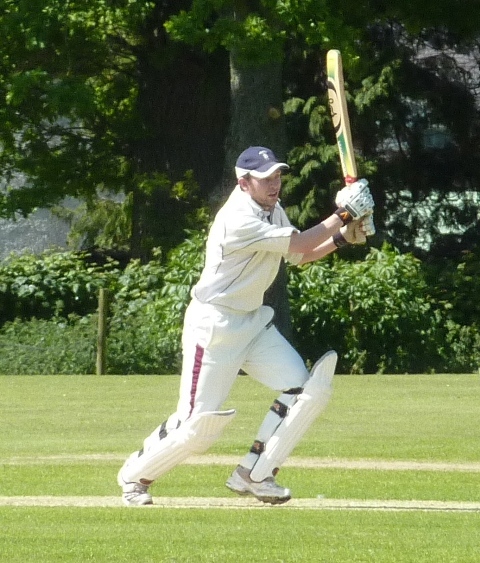 However Graeme Cross came in to provide the backbone of the innings. He and Davidson shared a sixty run partnership before a wide delivery tempted Davidson into edging a catch to short third-man for a robust 43. Ross Laidlaw joined Cross and with good running pushed the score past 160 before being undone by being bowled round the legs for a breathless 20. Meanwhile Cross had found his range and hurried on to a deserved fifty at just under a run a ball. However he also went bowled for 55 and at 197 for 6 with 12 overs to go the innings could have subsided. Important runs from McCutcheon, who was out to brilliant running catch, and then Cox with 15 not out sensibly took the score on to 252 with the last wicket partnership yielding 28. The GHK bowlers shared the wickets but the opener M Ahmed was rewarded with four wickets. The GHK innings started well for Nunholm with McCutcheon, second ball, darting the ball back to bowl a batsman who was leaving the ball. However S Ahmed came in and hit the ball straight effectively for a rapid 36 before departing to Davidson’s first ball. The score was increasing steadily at four an over as decisions didn’t go the way of the bowlers and as chances weren’t taken in the field. The opener Kamran had started very circumspectly but upped the pace in partnership with Mackay. When the latter was out caught by keeper Cross off McCutcheon GHK were exactly halfway on 126 for 3 with 22 overs left. Kamran was finding the boundary more frequently and was now the mainstay of the innings making his way to a century as the bowling attack was rotated. He found willing partners and when he was finally out, caught behind, for 130, GHK were on the home straight with twenty runs to get and four wickets left. Davidson took his fourth wicket but GHK scored the winning runs with over three overs to go after what had disappointingly turned into a fractious second innings on an otherwise sunny day. This Saturday the Nunholm side take on neighbours St Michaels at home in the local Western Union derby match.